The efficiency of the amount of time it takes for the plant to mature. The efficiency of minimized waste. The efficiency of using your space to its maximum potential. Harvest - understanding life cycle of plants, post-harvest handling, when to try for multiple harvest or when to cut your losses, cleaning up plant debris. Soil should be loose and rich and deep. In a container it should be a pre-mixed potting soil, not garden soil. If the container is large (1 gallon or more) it should have some drainage material in the bottom. Many things work well for this - styrofoam packing peanuts, crushed up plastic pots, gravel, etc. If a pot is very lare (3 gallons or more) the drainage material can be a little deeper, up to the bottom third of the pot. It is a good idea to cover the drainage material with a piece of burlap, an old pillow case, or some other type of screen or fabric to keep the soil from washing down into the material that should remain porous. 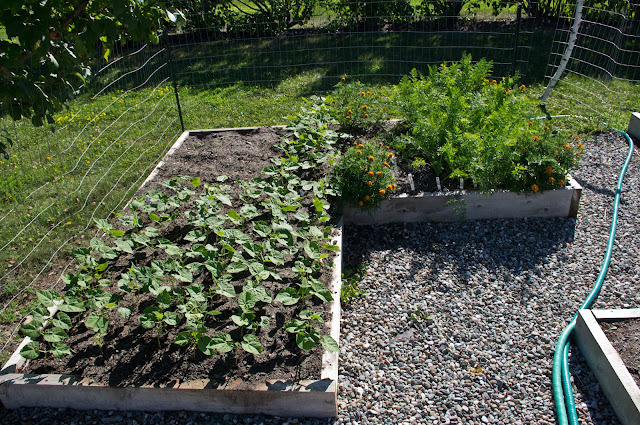 In a raised bed, it can be a combination of materials including pre-made finished compost, leaf mold (rotted leaves - make a pile in the fall, it’s good to go in the bottom of the raised bed in the spring), peat moss, rotted manure/bedding (a good source is horse farms), garden soil, sand and pre-mixed top soil / compost combinations. The key is to have a mixture of ingredients to re-create the complexity of a living soil system. it rots the plants, and disease can set in. Dry plants tend to be healthier plants. the plants take up water with their roots, not their leaves. You waste a lot of water and the leaves act as a nice umbrella for the roots, making it wasteful. You have to water more than necessary for the roots to actually start drinking. Getting the plants wet and watering the garden are two different things, and it is best not to confuse them. what is it’s shape? Shape of plants, physiological structure, and type of cells that make up the roots and the foliage all give you clues to what the plant needs. Thin fibrous roots dry out more than thick, tuberous roots (think of an onion plant vs. a tomato plant). Waxy, shiny leaves are more drought tolerant than matte, thin leaves (think of a succulent like aloe vs.a leafy plant like lettuce). 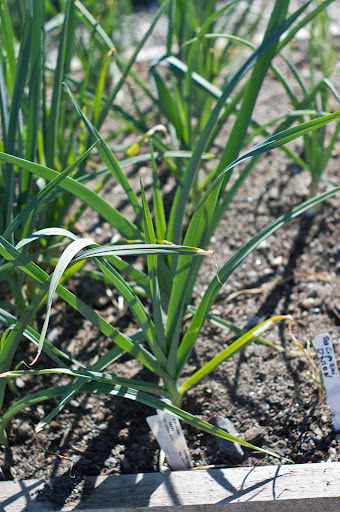 Large plants with broad leaves have very different requirements than skinny tall plants (think brcocolli vs onion). The canopy a plant creates is also a clue - plants with a small canopy (onions, celery, leeks) do not cast much of a shadow. This makes them very vulnerable to weeds. Plants that create a large canopy (squashes, cabbages, broccoli, eggplant) cast a large shadow which slows down weed growth. Understanding the shape or growth habit of a plant also helps you maximize the potential of your small garden. 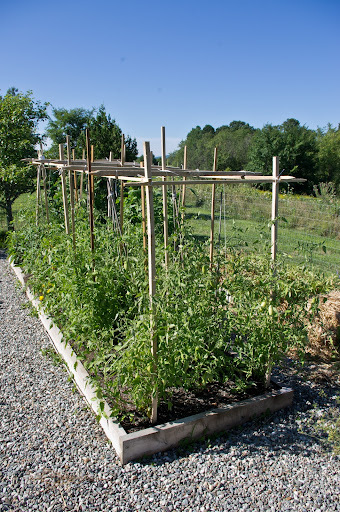 A tall, vining plant can be trellised. A low growing, sprawling plant can be planted on the edge where it spills onto a lawn. A tall, skinny plant can be tucked into tight spots. A pretty, decorative plant can be planted in the flower bed. how hungry is it? 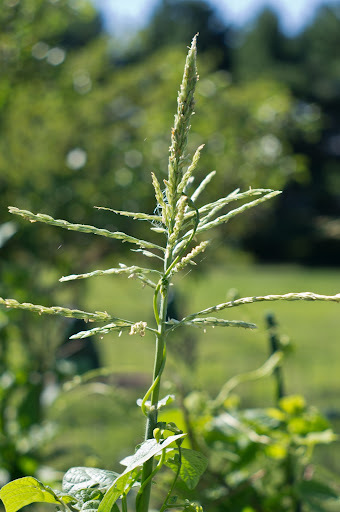 Plants that need a lot of fertility are often referred to as “heavy feeders”. One common point amongst most heavy feeders is their life span. A baby lettuce plant that is in the ground for 20 days is going to be a light feeder. A giant, prize winning pumpkin in the ground for 130 days is going to be a heavy feeder. Plants that produce fruit such as tomatoes, zucchini, squash, peppers and eggplant are best fed when in a vegetative state (all green leaf growth, earlier in the first 45 days of transplanting); once those plants are in their fruiting state, it is best to lay off the fertilizer or compost which support green growth, not fruit growth. The plant has only so much energy, and if it is putting it into leaf growth, it won’t also put it into fruit growth. It is a balancing act since the green growth needs to happen quickly and in a lush manner in the earlier part of the season in order to support healthy fruiting in the latter part of the season. how thirsty is it? As in the discussion of shape, a plant’s water needs have to do with its structure, but also with weather and soil type. A garden in sandy soil will always need more water than a garden in clay soils. You can look for cues of thirstiness in a plant and water just as needed. These clues include very slight curling of leaves, a blue-like hue that creeps in (this is very sublte), or a very subtle droop in the way flowers are angled. This type of “reading the garden” takes some observation to understand, but gardening is a lifetime project with countless places to learn. Fruiting vegetables tend to taste better with less water. Leafy vegetables tend to taste better with more water. 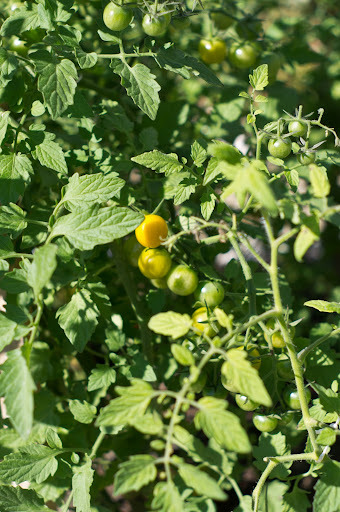 It is entirely possible to water tomatoes only once every two weeks, even in a drought, and get very tasty fruit. If you did that with lettuce, it would be bitter at best, but more likely it would simply be dead. how well does it share? A plant that knows how to share light, water, and nutrients with its neighbors is a plant that does well in small spaces. Radishes are a good example. 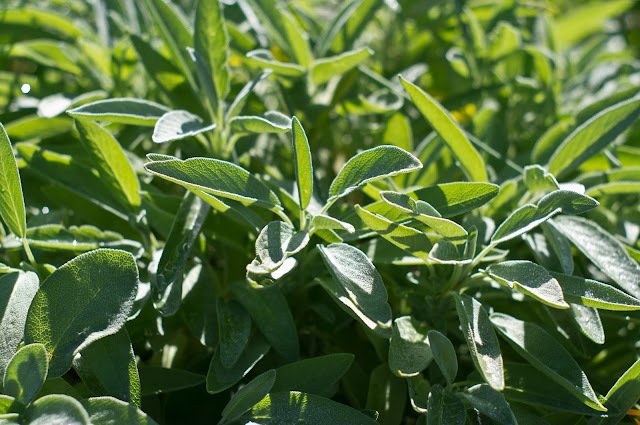 They can be sown alongside just about any other crop, and they do quite well because of their short life span, lower light requirements, and broader leaves that shade out weeds. Radishes can share. 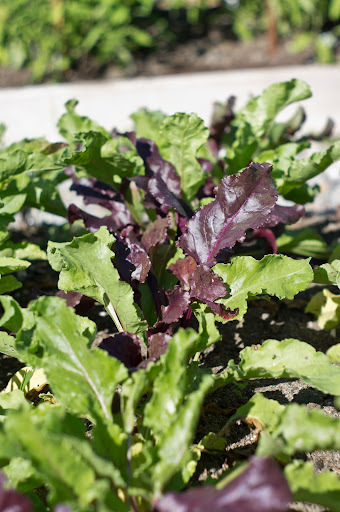 Other examples of plants that cooperate nicely: arugula, baby lettuce, scallions (they are skinny and can go in nooks), cilantro, curly parsley or smaller varieties of Italian parsley, strawberries and wild strawberries, and pansies. Notice....with the exception of scallions, all these plants are low growing, have broad leaves that create a canopy that shades out weeds, and can tolerate a bit of shade that might be thrown by a neighboring canopy. is the crop frost tolerant or not? is it a “multiple harvest” crop or a one time harvest? Once you know these numbers and the frost tolerance of a plant, you can make some simple calculations based on your season length to determine how many generations of a particular plant you can grow. For example, head lettuce has about a 40 day life cycle from transplant time to harvest time, and it can tolerate a light frost. This means you can start transplanting it in early May (in Burlington, average last frost is last week of May) or so, and you can repeat the planting of it every week or so, until early September. (in Burlington, average first frost is first week of October). Head lettuce is something you harvest only once, so if you want a nice head of lettuce every two days or so, you would plant 4 heads of lettuce a week, every week from early May to early September. This will give you a continuous harvest from early June until mid-October. 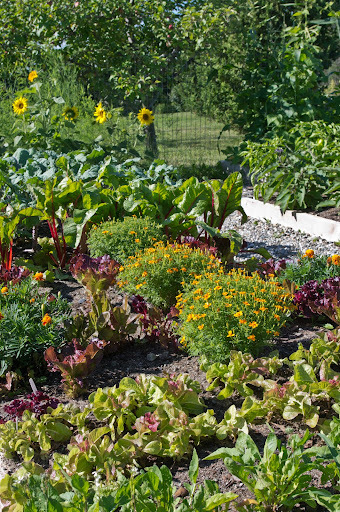 If you are the kind of gardener who “puts in the garden” on Memorial Day and then you never replant, it is likely that you have a big glut of produce at certain times, and then none that is fresh and good at other times. 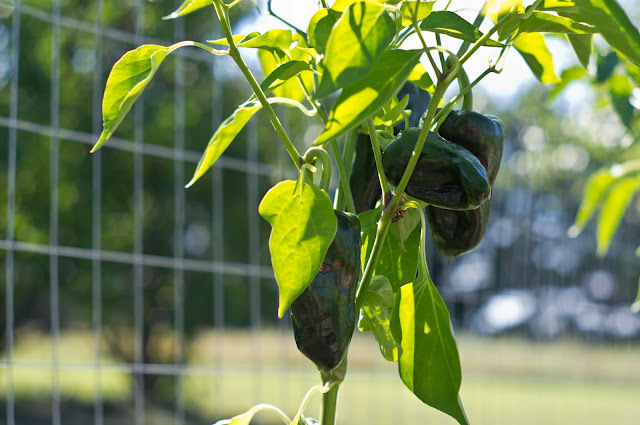 By planting multiple generations of plants, you insure high yields and great flavor. 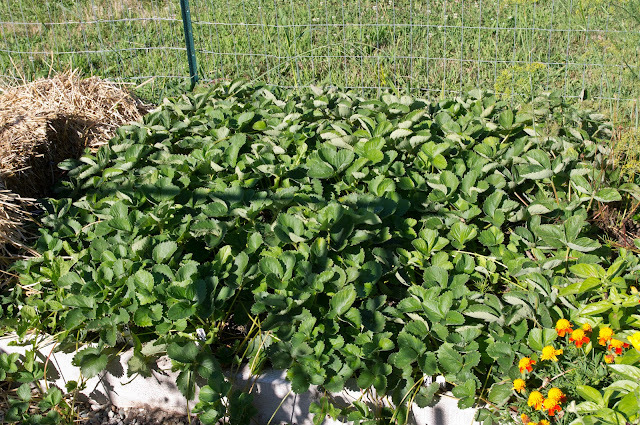 A patch of bush green beans only produces good quality beans for about 2 to 3 weeks. After a while, the beans are tough and sparse on the plant. 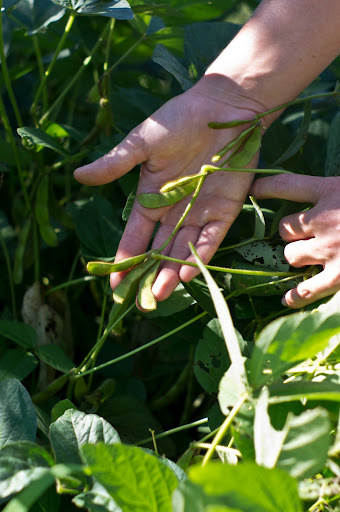 If you replant a new patch every couple of weeks, you will always have high-yielding, tasty beans. Abundant harvest happen on healthy plants at their prime, and gardens in small spaces require a certain amount of decision making. You always have a choice to pull out tired plants and to replant with new seeds or plants - this is often the most efficient way to have better yields. Mulch is a great way to keep weeds at bay, and to keep moisture near the root zone. It can also build soils, heat the soil, or cool the soil - all depending on your goal and what the plant needs. You can mulch paths and/or growing beds. Raised beds that are constructed out of wood can also be mulched and the paths around the raised beds can be mulched to minimize lawn mowing if you would like. If you use materials that naturally break down such as paper, cardboard, burlap bags, straw or bark, the mulched paths can become mini compost piles. 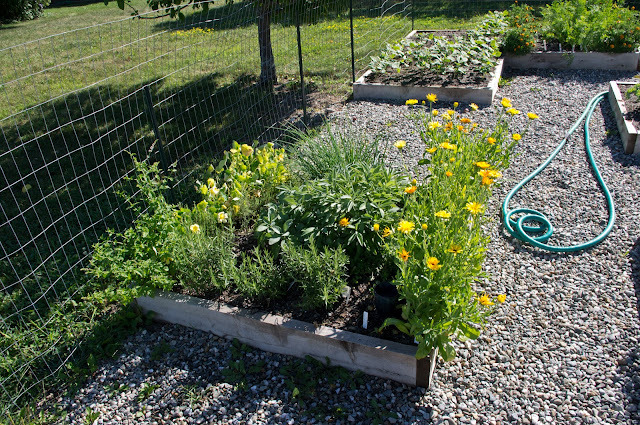 By layering in materials that block out weeds, you are creating a layer of organic matter that will decompose over the course of a year and can then be shovelled onto the growing beds the following spring. Some mulch materials carry weed seeds so beware. They can still be used effectively in the garden, but best as a layer that is covered up with another barrier such as cardboard or burlap. 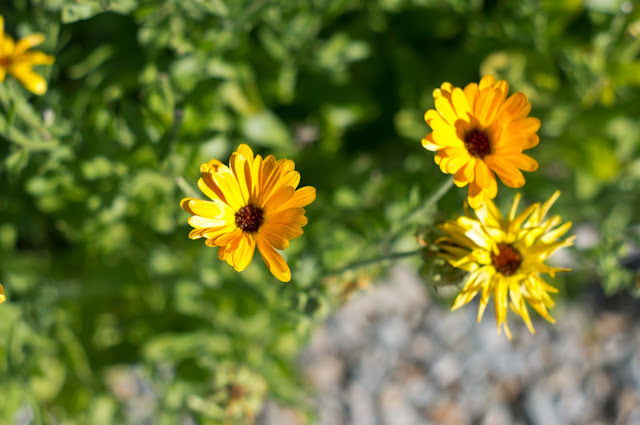 As it breaks down and heats up over time, the weed seeds lose their viability and will not be a problem the following year. 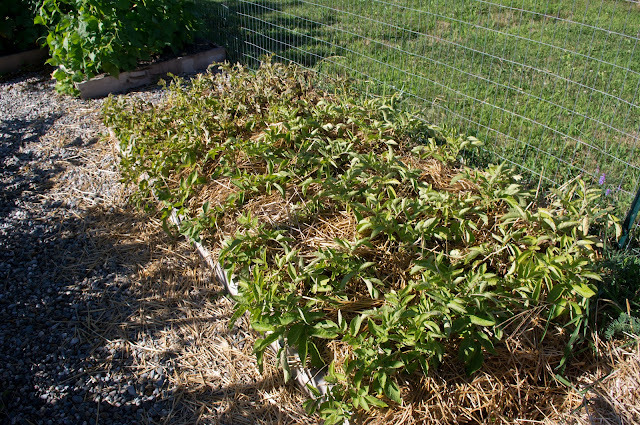 Plastic mulches heat the soil and are great for the heat-loving, fruiting crops. Harvest and post-harvest handling are other factors that affect the yield in your garden. Being able to plan or predict when you harvest a crop depends on your knowing the life cycle or days to maturity of that crop. It is entirely possible, to plan a garden harvest around certain dates or to plan for having no harvest during vacation times. An abundant harvest is one that happens when you want it. 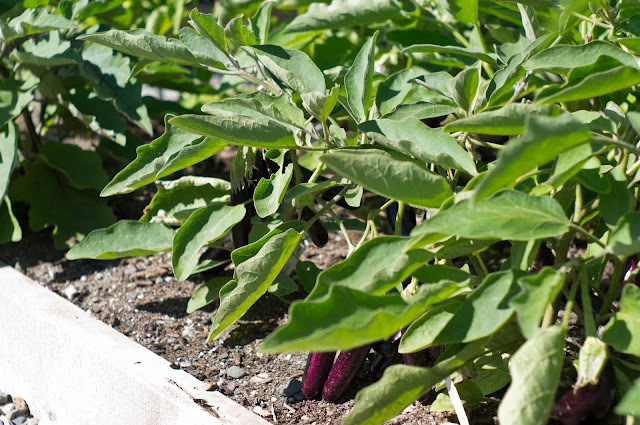 An unwanted harvest is a hassle - you have to get your neighbors to help, or find volunteers for a school garden, etc. Sometimes that works, but it is possible to minimize unwanted work, and under-appreciated produce by timing the plantings and knowing how much to plant of each crop. There are many charts on the internet that can help you gauge the garden harvest and how much to plant of each crop and when. Johnny’s Selected Seeds has some wonderful on-line tools, as does our own Red Wagon Plants website. Post-harvest handling includes everything from time of day you harvest, how you pack it into your basket or boxes, and how you store it. Morning is generally the best time to harvest since the field heat has not had too much time to affect the leafy green plants. Fruiting plants can be harvest later in the day. Again, this is a place where you can make a choice by harvesting the right plant at the right time of day. 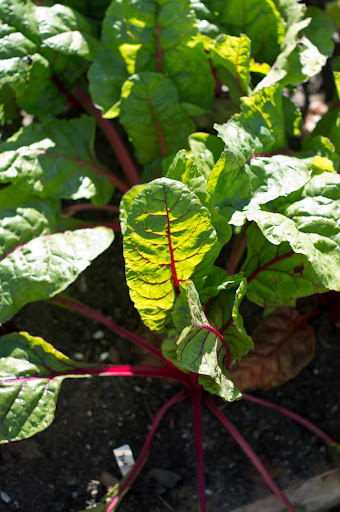 If you only have a few minutes to harvest in the morning, do the leafy greens. The fruiting plants can usually wait until later in the day or even a couple of days. Once a plant is cut or picked, it is best to wash it and refrigerate it right away. Again, this is related to an abundant harvest because anything that improves quality reduces waste. Lettuce that is wilted and dirty in the bottom of the fridge drawer is just not as appealing as lettuce that is crisp, clean and ready to eat. 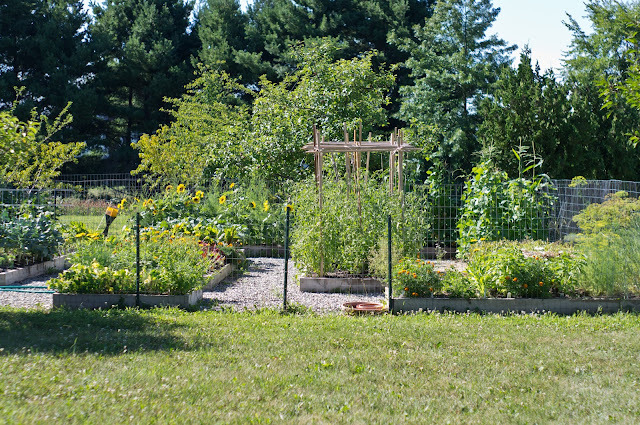 A small garden is not a productive garden if what you harvest ends up under-utilized. A good trick is to harvest the lettuce, and when you get in the house, soak it in a basin or large bowl of cold water right away. This takes out the field heat, the leaves absorb some water making them more crisp, and the dirt drops down to the bottom. Lift the leaves out, re-soak once or twice depending on the amount of dirt, and then spin the leaves in a lettuce spinner or by layering between some clean towels. Lettuce treated this way is sure to get eaten, promise! Plants like broccoli, beans, and tomatoes produce more the more they are harvested. Broccoli will generally make one big head, and then produce what is called side shoots all summer long. These shoots are the perfect size for cooking or eating raw and the more you remember to cut them, the more the plant will produce. 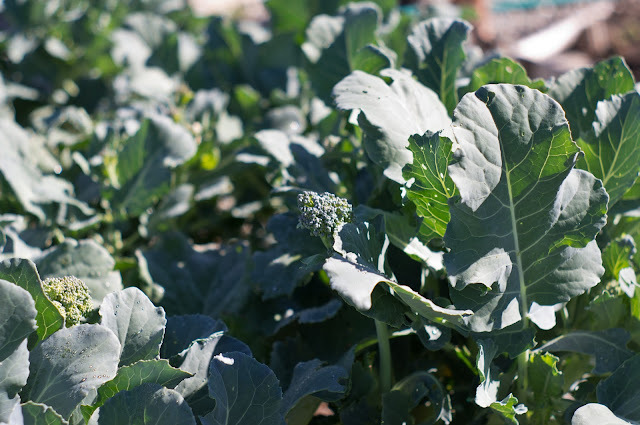 Often a broccoli plant that goes into the garden in late April will continue to produce side shoots into mid-December - talk about a high yield! Most fruiting plants (tomatoes, cucumbers, squash, peppers and eggplant) will also produce more the more they are picked. These do not need immediate refrigeration, and tomatoes and basil should never go in the fridge. A basket full of cukes and zukes can stay on the counter until a time later in the day when you have had a chance to make room in the fridge or have time to make pickles,etc. Again, a high yield can be a burden or a blessing, depending on how it fits into your life. With a little planning, a very small garden such as a 4’ x 8’ raised bed can include 2 tomato plants, a cucumber plant and a season’s worth of greens. This is often plenty for a single person or a couple. Abundant harvesting is about making choices that lead to efficiency and no waste., beauty and no guilt. If you use your minimal space for vegetables that you will not use, then the space is wasted, if instead that small space is regularly turned over with fresh plants, and old plants are removed, then you will have a high yield of well loved produce. It is always a better choice to remove the garden debris (think bolted lettuce, cabbage stumps, woody radishes) than to let it limp along, tempting disease and pests. Johnny’s Selected Seeds, High Mowing Seeds, Territorial Seeds, Seed Savers Exchange and Botanical Interests are all reputable seed companies with lots of educational materials on their websites and in their catalogs. These are great sources of free information. Charlie Nardozzi offers a garden coaching program and gives weekly talks on VPR about gardening. Friends of Burlington Gardens offers support to school gardens, community gardeners, and anyone interested in learning how to grow food. 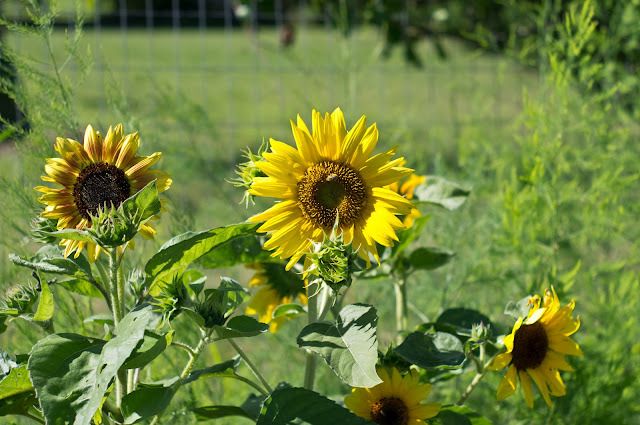 They offer a season long course at Ethan Allen Homestead that provides brand new gardeners all the support necessary to achieve success in their first year. Well, it's that time of year when we start getting lots of calls and questions about common garden diseases and pests. This post will be the first in a series focusing on how to manage these issues when they arise so that they don't get out of hand. It is wise to pay careful attention to your plants - sometimes small changes in their appearance can indicate a potential problem. The internet is a wonderful resource for solving your garden mysteries, but a good gardening book like Rodale's is indispensable for the serious gardener. If neither resource is available to you, don't hesitate to call us and we can help you troubleshoot! What is Powdery Mildew (PM)? Powdery mildew is a white fungus that mainly affects plants in the squash family (cucumbers, melons, zucchinis, etc.) but can also affect other families as well. It first appears on the undersides of leaves as white dots, which expand until the whole leaf looks like it's been dusted with a white powder. Garden fungi are propagated by spores that fly on the air, which makes them difficult to prevent. The fungi are more likely to grow on plants with a lot of moisture in and on their leaves, and in humid conditions with too little air circulation. It is also carried from plant to plant by insect pests such as squash bugs, cucumber beetles, aphids, and flea beetles, so managing these pests helps reduce the prevalence of PM. How do I prevent PM? - Check for insect pests every few days. Squish the pests when you find them, and make sure to look for and destroy their eggs as well. A little vigilance goes a long way! - Space plants further apart so that the sun can hit all parts of the plant, and air can move easily through. - Only water in the morning, when plants will have plenty of time to dry during the day. - Practice good crop rotation. Never put plants in the squash family in the same place as they were the year before. How do I manage PM once I have it? - Remove the worst-infected leaves with a pair of scissors or pruners. DO NOT put the infected leaves in your compost pile! Either burn them or put them in the trash. After pruning, wash your hands and tools with soapy water or a dilute bleach solution before touching other plants. - Spraying with a sulfur- or copper-based fungicide once a week on the top and undersides of the leaves will eliminate most of the fungus. Follow this regimen up until 2 weeks before harvest. Alternatively, a mixture of 1 teaspoon of baking soda per quart of water can also be used. Try to spray only in the morning, when the leaves will have plenty of time to dry in the sun. Allison Lea, our incredible seeder, eagle-eyed pest finder, and all around special person wrote this beautiful piece on seeds. We love her writing, and hope you enjoy these thoughtful words. I've had seeds on my mind lately. Not surprising, given the time of year, and the fact that I've been planting seeds for a living for the better part of a decade. 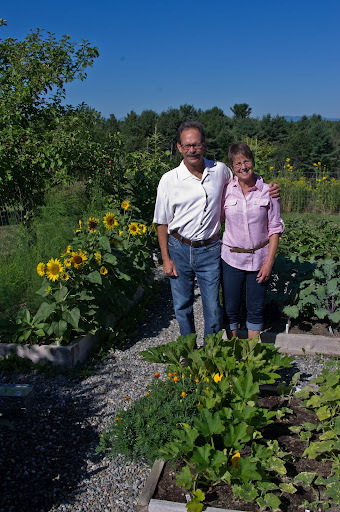 It's easy to forget about seeds, during the long months of a Vermont winter. But then that first warm day comes, and with it the scent of damp earth, and suddenly I am visualizing thousands of seeds lying dormant in the ground, waiting and working. I consider myself lucky, because I get to experience an early spring in the greenhouses. While the outdoor seeds are still mired in mud, ice, snow and more unpleasant bits of thawing matter, I am opening crisp white packets and distributing their contents into the warm fluffy soil from Vermont Compost: onions, lettuce, kale, various greens, annual flowers, tomatoes, peppers. I love my job for its ability to provide me with an invaluable set of simple lessons for life. First: start small. Some of the seeds I plant are truly no bigger than a pinprick. Yet even the smallest one contains all the knowledge it needs to become a complete plant. Inevitably, I have moments when I feel as though I'm flailing around in my life, looking for answers outside myself, or feeling overwhelmed by the sheer volume of information literally right at my fingertips. And then I find myself standing at my seeding bench inside the greenhouse, holding a handful of seeds in my hand and realizing I have all the answers I need. I've always had them. Second: calm down a little and be still. While there are many seeds which travel for miles and miles on the wind or hitched to the back of some animal (mainly my dogs, it seems), all the seeds I've handled germinate best when they are left in peace. They're not going to be thrilled if I keep jostling the tray around, or picking them up, examining them for signs of life, and putting them back down. Likewise, when I allow myself to slow down and breathe a little, I start to get more of a grasp on the person I am becoming. Stillness is the key to sprouting, so when I feel myself flitting here and there, reluctant to make a commitment or put down roots, I go back to my seeds, peer at them thoughtfully, and then step back and let them be. Third: not all seeds are going to germinate. Some seed packets will say 60% germination rate. These seeds I sow a little thicker, in order to compensate. If all of them sprouted, I would have a very crowded plug tray, and unhappy plants. I have lots of great ideas, but they're not all going to come to fruition, so letting go of my attachments seems like a good plan. And finally (although the lessons continue indefinitely) cracking open is a good thing. I've seen thousands of little seedlings, and that first green shoot pushing up through the hull never ceases to delight and amaze me, whether it happens in the greenhouse, or out in the garden. So as I strive to make sense of a world which appears to be literally cracking apart under our collective feet, I will keep coming back to the modest little seed, looking for signs of something new and amazing coming through. If you ask me what my favorite plant is in my garden I would tell you about my bay laurel tree. Many folks are excited by the plants that add beauty to their surroundings. Personally I love the plants that I can use in the kitchen and my bay tree adds value year round. 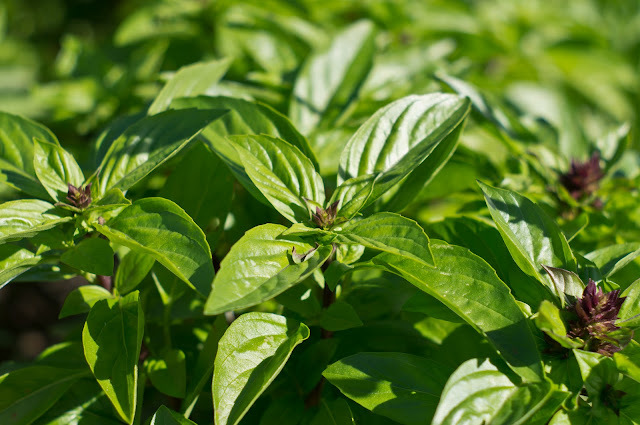 (The fact my favorite plant is a culinary herb would be no surprise if you follow my blog, Hippo Flambe). The difference between a leaf picked off my tree seconds before using it is far removed from the dry, dusty leaves in the spice section of your supermarket. Plus my bay laurel has the added benefit of being easy to care for. It was a rather inauspicious start to my bay laurel tree farming. I was given the tree by a friend who had decided to "euthanize" her tree. Her tree had developed a sticky residue on the leaves and she did not want to spend the time cleaning the leaves. In addition it had clearly outgrown its 23 inch pot and she had visions of it taking over her house. I immediately jumped at the chance to own my own bay laurel tree and told her not to kill it, I would adopt it instead. When I arrived at her house one day in the pouring rain I stared at the giant tree and I began to wonder how well this was going to work out. The first problem was how to get it in the back of my station wagon, even with the rear seats folded down it was far to big. So we went after the tree with clippers, ruthlessly cutting back every limb. In the end the tree had lost considerably more then 50% of its branches and I remembered the advice to never prune a tree back that far. I shrugged and figured what was the worst that could happen, even if it died the tree was free to me, I had nothing to lose. That winter we kept the tree in an upstairs South facing window and miraculously it began growing new leaves almost right away. I did not give it any artificial light or fertilizer, we just opened the blind from 7 AM until it was dark. The room it was in only gets passive heat from the other rooms, so the room temperature is often as low as 59 degrees. The tree was severely pot bound as even in a 23 inch pot 1 qt of water would come rushing out the bottom almost immediately. Every week it put out tiny new shoots and leaves and I began to take more leaves to cook with. After using the leaves a few times I began to care more about my bay tree. That spring we began to search for a larger pot. I was told at many locations that I could get a larger ceramic pot but not plastic. It had taken 2 of us to slowly inch the tree upstairs in a plastic pot, ceramic and its extra weight was clearly out. Finally one nursery suggested I try bonsai-ing the roots. She explained bonsai tress are removed from their pots and then pie shaped wedges are removed all the way around the root ball so more soil can be packed in and the tree can stay in a smaller pot. So I bought some high quality soil and we hacked out 4 pie shaped wedges all the way around the root ball. When I returned the tree to its pot I was amazed at how much water it could now hold. After a few weeks of new growth it was clear the plant was much happier. Taking care of my Bay Laurel tree is remarkably simple, especially as I am often a house plant slayer. In the Fall, sometime in October, we bring the tree indoors. Once indoors we water sparingly about once a week, although I know there are stretches where we just forget. In the spring we take the tree back outside, where it does not need watering unless there is a really extended dry spell. If you prune it a little in the spring it will produce new growth. Use well drained, fertile soil. I just recently applied some of my favorite tomato fertilizer to the soil. The next time it becomes pot bound I will again bonsai the roots. The sticky residue that my friend found on the leaves is caused by scale insects. If this occurs just wash the leaves with an insecticidal soap and use your nail to scrape away any insect bodies on the leaves and stems. You can also spray with alcohol. The sticky residue is not usually deadly to your tree but it will inhibit new growth. Try to keep it in a humid area but do not over water. Humid in Vermont in the winter is hard, just keep it out of drafts and away from the heating vents, misting them occasionally with water if you want. The great thing about growing a bay laurel is you only want the leaves, which are the easiest part of a plant to maintain. If I was starting over with a smaller tree I would not allow it to become as big as mine is, this would make it easier to bring it in and out of the house every year. When cooking with it remember the fresh leaves are much stronger and more flavorful then dried. When a recipe calls for 2 leaves I only ever use 1. If I just want a slight bay flavor I use a smaller leaf. One of my favorite uses for the leaves is to flavor a pot of red lentils. I just add one leaf to a pot of simmering red lentils with kosher salt and cook until the lentils are tender. To serve I simply drain the lentils, drizzle with flavorful extra virgin olive oil and sprinkle with freshly ground pepper. I am never too sure about what to do with old seeds. Sometimes I throw them around on bare patches of earth to see what will come up and other times I sadly throw them into the compost or trash. Most importantly, I try to be really careful to order only what I can use within the lifetime of the seed. This past season was pretty hard on tomatoes. Lots of rain, cool temperatures, and very high disease pressure made for less than ideal conditions. 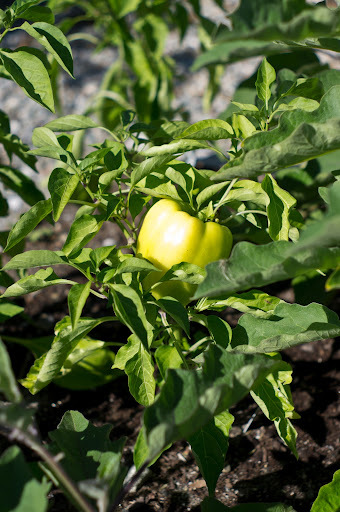 At Red Wagon, we grow varieties that taste really good and that produce well. Sometimes those two things don't always go together, and flavor is sacrificed for high yields, or the other way around. Our tomato variety list has always favored flavor; in other words, we grow lots of open-pollinated, heirloom varieties that don't always produce high yields, but whose flavor is far superior to those hard lobes lurking on grocery store shelves. All of the 'heirloom' varieties you see in catalogs or in our plant displays have stopped being commercially produced by large farms, and while enjoying a renaissance among small, local and organic farms, their lack of shipability (too delicate) and irregular shapes and sizes will likely make sure they remain a stranger to the tractor trailer. For the sake of clarity, let me explain something about the language used to describe plant varieties. 'Heirloom' and 'hybrid' are not exactly parallel terms. Their is no botanical definition of an 'heirloom' - that is just a folksy way of saying a certain variety has been around a long time, it is open pollinated (more on that in a second) and there is often some sort of story associated with how the seed has been saved over many generations. The heirlooms often taste better--but not always--and sometimes the propaganda around an heirloom's attributes eclipses the reality. 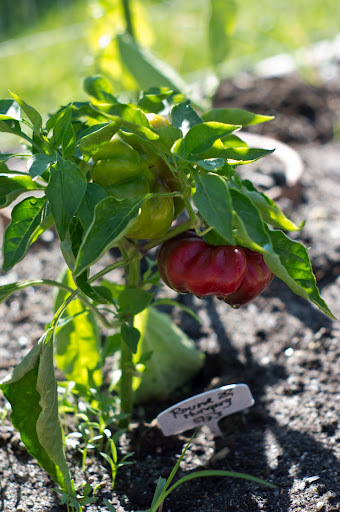 A hybrid variety is a plant that has been bred from two different tomato varieties. This gives it, in theory, hybrid vigor. For example, one parent is known for its resistance to pathogens but has the mouth-feel of a doorknob while the other parent is famous for flavor, but withers at the sight of a fungal spore. A hybrid variety is bred with a higher degree of human intervention, than an open pollinated variety. This simple plant breeding has been going on since the beginning of agriculture and is not to be confused with recombinant DNA breeding which is inter-specific (think fish genes in a tomato). Open-pollinated varieties are plants with the same exact parents and are bred with the simple aid of wind, insect, or plant mechanics--i.e. humans don't have to get involved other than to isolate the plants from other varieties, and to collect the seed etc. All 'heirloom' varieties are open-pollinated, but again, remember that 'heirloom' is not a scientific term, it's more of a literary term - think "plants with stories." A while back, a New York Times editorial by chef and restauranteur, Dan Barber, confirmed what I had been thinking: that in order for our agriculture-and on a small scale, our back yard gardens-to thrive, we need to diversify. This past summer, those gardens that included a mix of heirloom tomatoes and hybridized tomatoes probably had better luck over all. I know that in my garden, that was true, but I was still a little surprised that the margin between the two was pretty slim. In spite of the harsh conditions, my tomatoes did pretty well. I gave them lots of mulch and lots of space between the plants and I regularly clipped off yellowing vegetation. Surprisingly, some of the hybrids died really early on (they are bred for resistance to certain pathogens, but not all), and some of the heirlooms clung on for dear life until our first (very early) frost. So the lesson I learned is that the best thing to do is to have a mix of varieties, and hope for the best. I would not suggest growing only one favorite heirloom; if there is room in your garden, grow a plant or two from each category - heirloom and hybrids of slicers, cherry, paste, early producers, late producers, etc. I know this is not practical for small spaces, but just a guideline to use in your garden planning. We are adding some new tomatoes for the 2010 season, and so far, here is what I have come up with. Please feel free to leave me suggestions, that is our favorite way of trying something new. Pink Beauty - a hybrid with firm, delicious fruit. Pink, medium-size, 6-8 oz. 74 days to maturity. Fantastic - A customer request. A hybrid with 3 to 5 inch round, firm slicing fruit with good shape and crack resistance. Meaty, bright red and with exceptional flavor. Indeterminate. 85 days to maturity. Black Cherry -A small and pretty cherry tomato with rich, sweet flavor. Nice in mixed tomato salads. Black tomatoes are really a deep mahogany and are known to have superior flavor. Open-pollinated. 64 days. Paul Robeson - An heirloom. A well loved tomatoes on many people’s “favorites” list. Dark red fruit tinged with black, brown and purple flesh and skin. Rich flavor with hints of spice and red wine. Varies widely in size, but averages 10 to 12 ounces each. Does well in colder temperatures; seed is from Siberia. 74 days.